We have one of the coolest posters we have seen in a long time! 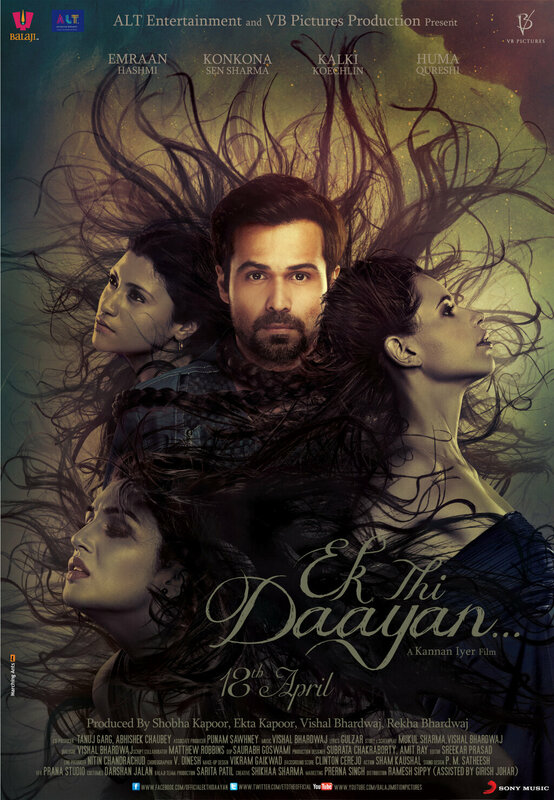 Check out the first poster for Ek Thi Dayaan! Starring Emraan Hashmi, Kalki Koechlin, Konkona Sen Sharma, Huma Qureshi, this Kannan Iyer directed thriller is set to haunt you we mean hit theaters on April 18th! Bobo is India’s leading magician. But unknown to even his girlfriend Tamara, Bobo’s life is falling apart. His constant hallucinations leave him with no option but to seek psychiatric help. Going through regression hypnosis, a terrifying story about his childhood surfaces involving a sinister power called Daayan who has not only destroyed his family but also promised to return to haunt Bobo. He chooses to ignore it and move on with his life. Just when his career and love life is at full throttle, enters the irresistible Lisa Dutt. Bobo is convinced that she is the daayan. But is she, really? Or is he just losing his mind? Positively, among the most keenly awaited films of the new year, Ek Thi Daayan, marks the first ever association of two creative powerhouses – Ekta Kapoor and Vishal Bhardwaj.